Many of us have long-term project cars that tend to sit for months, or even years at a time. I'm looking out a window at my Reliant Scimitar right now, thinking that I need to get that back on the road. Most of us assume the luxury of time to get it done. But some people, like Robert Tischler, aren't so lucky. 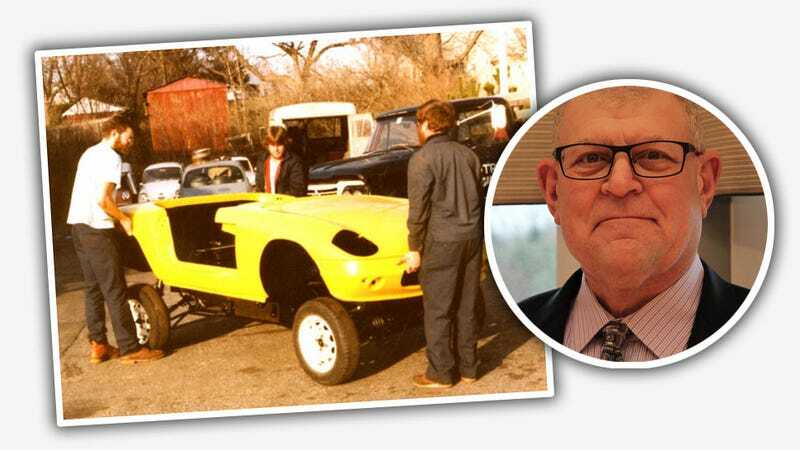 Robert Tischler has two things that loom large in his life right now: a partially-restored 1965 Lotus Elan and a case of stage III Hodgkins Lymphoma that's recently become unresponsive to chemotherapy. Rob has been a lifelong gearhead, and has always been generous in lending his help, expertise, and tools to those who needed him. Now his family is asking for help in return. Our father, Robert, is currently battling stage III Hodgkins Lymphoma, and has been for several months. While the family always tries to provide him with our support and love during these difficult and uncertain times, we are hopeful that the generosity of others will allow us to bring to reality a dream our father has had for years. In the early 1980s, Robert purchased a 1965 Lotus Elan as a project and, at that time, spent several months restoring it in preparation for the vehicle to be driven on the street. Unfortunately, near the end of the restoration, the challenges of being a father, husband, and student prevented him from finishing the car. What began as a small hiatus stretched into a two decade long break. While Robert's plan was always to finish the car, various aspects of life constantly prevented it from happening. And when his time was free, he was always eager to help others with their projects, whether it was teaching me rust-repair and bodywork on my first car, an '89 Volkswagen Golf GTI, helping my brother rebuild countless engines, or even lending a hand to my friends when they had automotive troubles. Just when it started to look like time and resources would allow our father to resume work on the Lotus and see his dream become a reality, tragedy struck. The next two years would prove to be the toughest chapter for him and our family. In early 2012 he was laid-off from his job working in the automotive industry which delivered a damaging blow to our family and our houseold. Then in the late summer of 2013, Robert was diagnosed with stage III Hodgkins Lymphoma. He has undergone an excruciating number of tests and procedures and completed 8/10 rounds of chemotherapy. Just as we thought we could look to the future, the cancer stopped responding to the final rounds of chemotherapy treatment and currently we sit in limbo waiting for more biopsies, test results, and countless procedures. What we hope to do is generate enough funds to start buying parts to complete this project. My brother and I are both full-time students and simply don't have the income required to purchase all of the parts needed to get the Lotus back on the road. We are, however, armed with the man power, know how, and determination to complete our fathers project. This car means the world to him and we want to be able to give this project an honest shot so he can finally drive the car of his dreams. Once progress is underway, we plan on updating this page with entertaining and fun-to-watch videos of our progress. Through the camera, we will bring you into our garage and our family so you, as a contributor, can see your money hard at work, restoring our fathers vintage racer. The impact of this campaign is two-fold. It will give our family and friends the opportunity to relieve stress, bond, and spend more time together. Also, if any funds remain after the completion of this project, they will be put towards our fathers medical bills. It's easy to understand how much being able to finally drive the Lotus would mean to Robert. The person who sent us this link, Derrick Wansom, met the Tischler family on a local car forum when they offered their garage, tools, and time to help him with a tricky repair. It seems like folks like generous folks like that are the ideal sort to get some help from a welcoming community of car lovers to help achieve this final dream.